I pop out of the depths of nowhere to present you with this fanbook I've been working on!! ▼ a randomized 20 orders (1 order = 1 book) get a double-sided clear acrylic RavioLi charm! Yay!! Preorders close on May 31st! I really like this concept of having two heroes since I first came across A Link Between Worlds, but I went all out with the key differences between them. Ravio doesn't quite think or act the same way as Link, and they're complementary to each other, so my vision of Ravio as a hero has a different color scheme and weapon (Master Rod), as he's clearly adept in the arcane. I went with the phrase "pure of heart and strong of mind" for the Master Rod to complement the Master Sword's "pure of heart and strong of body". You can check out the design on my page if you're interested. Oh yeah, I just noticed... Ravio is also left-handed like Link, but you have him holding it with the right hand in this, which is of course what happens when you mirror the lines. I like how they took the idea of counterpart in a more complementary route, as opposed to simply opposites. It's very thoughtful how they made Ravio. I'm way late to this fandom. XD Is this zine still available for purchase in any way? That was so cute and well done! Definitely worth the money. Thanks for the link! wow i cant believe your here! like i mean on deviantart, a close friend bought me your book months back and iv treasured it ever since. I live in germany....HOW CAN I GET THIS ????? I ship internationally, but this book is sold out. I've always wondered what Lorule's version of the Master Sword would look like. THAT 'S MY FAV PIC!!!! DAAAAAAWWWW!!! I posted a review for this on your website, but I never have said here that I really really enjoy the art. You did a wonderful job with it. Bought this book at AX and love it! Ah the feels in it. I loved the mini comics and illustrations. 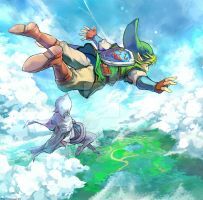 I just love your Link and Ravio arwork. It is probably my favorite for that. Two Worlds Two Heroes One Epic Adventure. That is a really great image! Nice job! I love your artwork for this game! I really like how you put all the details in the triforces. That's just beautiful! good job! Nice work ! It's a nice cover! The composition here is fantastic, the perfect cover for a fan book such as this. Man, I really need to play this game.. amazing art though! I really like it.